We’ve talked about fractions while talking about measuring cups and working on money, but the kids were struggling with understanding how different fractions could be put together. The homemade math manipulatives we made to work on adding and subtracting double digits were a huge hit, so I decided it was time for us to make our own fraction manipulatives that we could use in different hands-on activities for equivalent fractions. 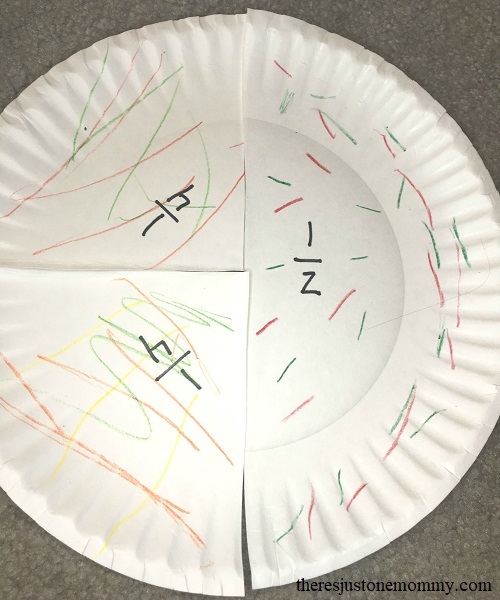 My kids had fun decorating our paper plate fraction pieces with colorful sprinkles and turning them into cookies. You could also leave the plates plain or turn them into pepperoni pizzas. 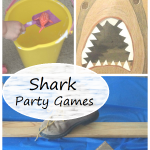 Letting your child decide how to decorate them will make it more meaningful for them. No matter how they decorate them, you will cut and label the plates following the directions below. Use a black permanent marker to label one paper plate 1 whole. Fold another paper plate in half, making sure the edges match. Crease the fold and then carefully cut along it. Label each portion 1/2. To make your fourths, fold and cut another plate into halves. Then fold those half portions in half again and cut them apart. Label these each as 1/4. Do the same thing to make the eighths, and then fold the fourths in half again, making sure the edges line up. After cutting on the fold lines, label each portion as 1/8. If desired, you could follow this method to make slices that are each 1/16. By placing all the corresponding pieces together on top of the 1 whole plate, you can easily show your child how they add up to one whole. This makes it easy for your student to see that eight 1/8 pieces equal a whole and four 1/4 pieces equal a whole. 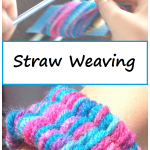 You can also make 1/3 and 1/6 pieces for your child to work with. To make 1/3 pieces and 1/6 pieces, start by folding a paper plate in half and cutting along the fold. Then fold one side of each half over 1/3 of the way and fold the other side over. Carefully line up the edges, crease the folds, and cut along the folded lines. Label these as 1/6. To make 1/3 pieces, use one of your 1/6 pieces and line the edge up along the edge of a blank paper plate. Use a pencil to draw a line along one side of this piece, then lay a second 1/6 piece right next to it and use the pencil to draw a line on the other side of it, creating a piece that is 1/3 of your paper plate. Do this again to equally divide the plate into three pieces. Label these as 1/3. 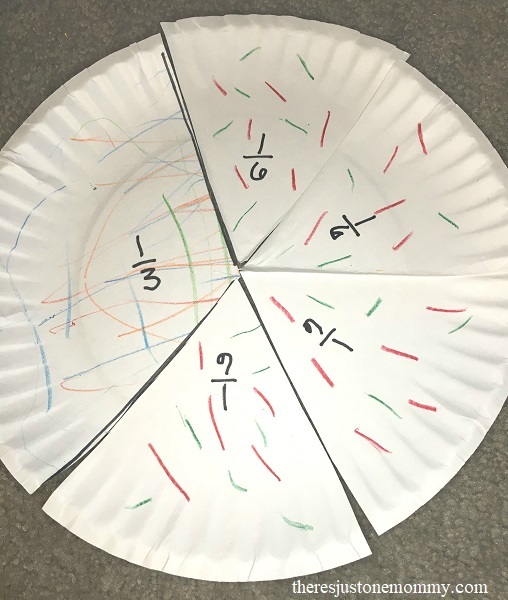 The paper plate fractions are great for learning how to create a whole using all the symmetrical pieces, like all the 1/8 and all the 1/3 pieces. They are also good for working on equivalent fractions. By placing 1/4 pieces onto the halves, your child can see that it take two fourths to equal one half. They can also use these pieces together to find new ways to create a whole. You can continue this with other fractions. How many 1/6 pieces does it take to equal 1/2? 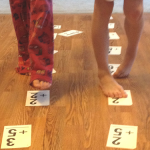 After working through several together, allow your child to explore the fractions on their own. Remind them that pieces must fit side by side without overlapping. How many different ways can they use the fractions to create a whole? 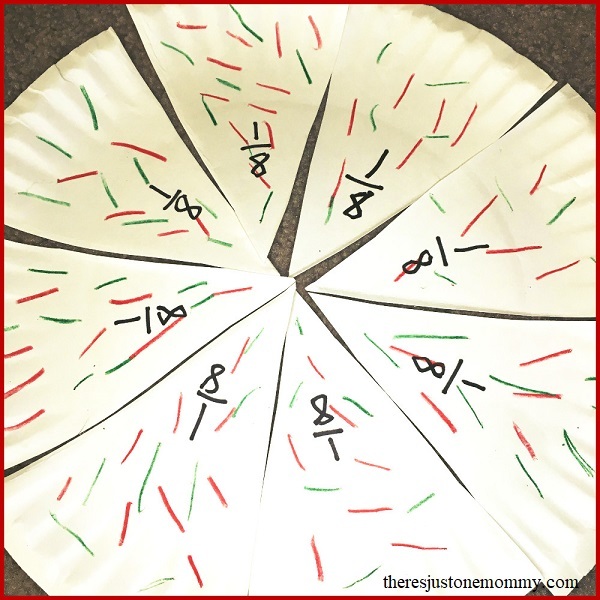 You can also use the paper plate pieces to work on adding fractions with common denominators. Line up several fractions with the same denominator (number on the bottom). 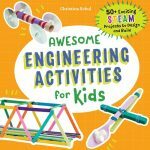 Show your child how 1/8 + 1/8 + 1/8 = 3/8. Demonstrate a few other problems before letting them explore further on their own. 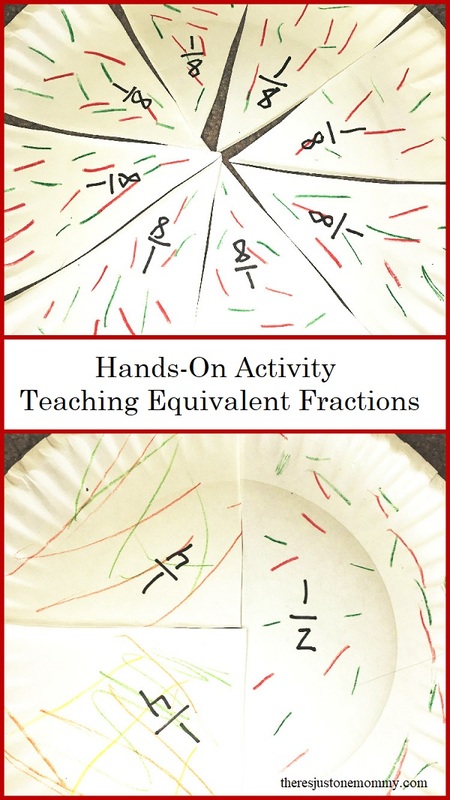 These simple DIY fraction manipulatives are perfect for hands-on activities for equivalent fractions. 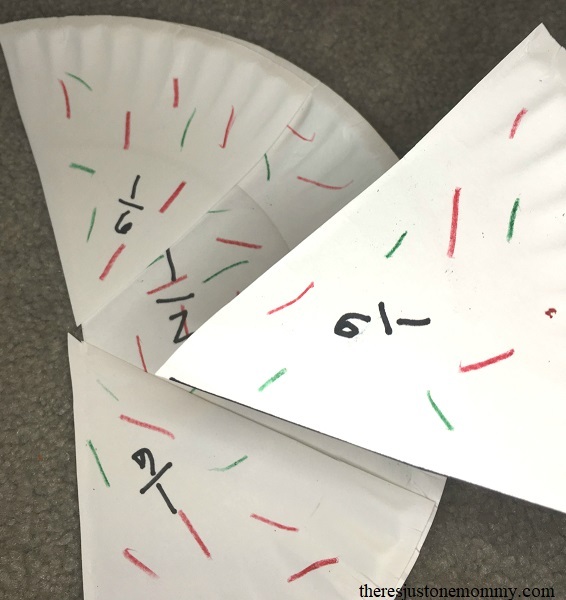 Being able to put the smaller fractions together to form larger fractions allows kids to really see how the fractions are related and makes a tricky math skill easier to learn. Looking for other fraction ideas? Check out the printable Fraction Flowers from Teach Beside Me.